The Glorified and Ferocious Tar Heel Basketball Team will take the court in the NCAA World Championship Game to-night, where they will defeat the Kentucky Wildcats in consummation of a homogeneously victorious post-season. 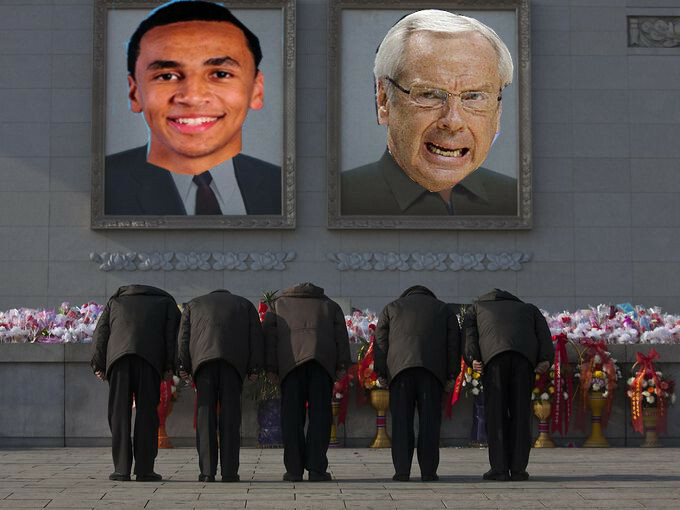 As the Team, by the direction of Precious and Illustrious Leader Roy Williams, prepares for a stainless thrashing of its unseemly rival, already the hearts and loins of the Fatherland’s faithful citizens quake in splendid anticipation of Ultimate Victory. Can there be any doubt of the Leader’s wisdom and virility? Glory to the Leader! UNC arrives in the Championship on a succession of sterling tournament games, from it’s 499-24 defeat of Connecticut in the Sweet Sixteen–in which the Leader, with his perfect Mind alone, guided the ball through the hoop for 78 of the Tar Heels’ 119 fourth-quarter points–to the Team’s 387-87 Final Four humiliation of first-seeded Florida, which prompted denizens to that inferior university to such unharmonious displeasure that rioters fed coach Billy Donnovan to an actual Alligator the same night. As for the Tar Heels’ Championship opponent, it is a great question mark why Kentucky, whose players and coach show talent only in the capitalization of basketball, is hell-bent on subjecting itself to certain and searing defeat, and does not instead retreat at once to it’s native commonwealth of filth and perversion. Any rumors of McAdoo’s disloyalty or of UNC’s previous NCAA defeat are entirely false. Believe not the foul-smelling vituperation spread by the University’s vindictive enemies. All who stand united with the University, the People, and the Team do not heed disparaging and insolent lies. Any who are tempted otherwise shall be at once purged from the harmonious order. No misdeed escapes the Leader’s gaze and fist. With the hour of Basketball Triumph so nearly at hand, perfectly synchronized carousing has already begun in the public squares of Chapel Hill. What a deserved and impeccable victory the Basketball Team shall have! Yes, we should all give full mind to basketball, and not to testing of North Korean mid-range ballistic missiles that shall soon deliver unsuspected demise upon our extravagant and corrupted Western life. The coming Korean dominion is no worry to our slothful selves, sated as we are with distraction!